I drink coffee. A lot of coffee. 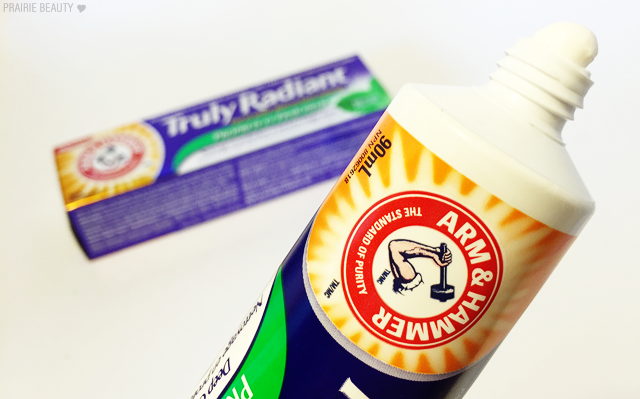 Anyone else who drinks a lot of coffee will know why that's the first thing I'm mentioning in a review of toothpaste. For those of you who don't... Coffee can be very staining for your teeth and I find that if I don't use a good whitening toothpaste, my teeth look dull and not even the most perfect blue based red lipstick can bring them to life. I don't whiten my teeth, because I worry that it'll make my teeth more sensitive than they already are... and also because I'm lazy, but I do absolutely want a bright, beautiful smile just like everyone else. 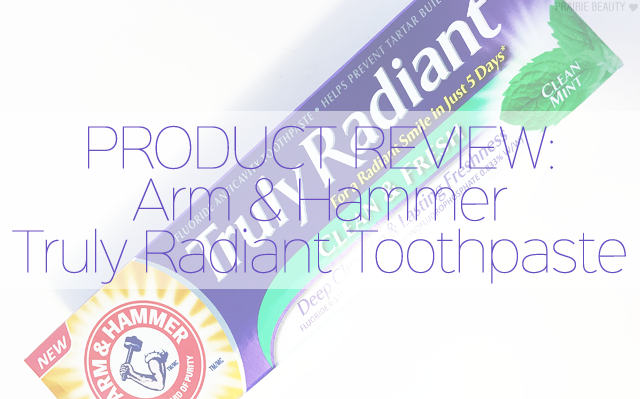 Anyway, recently I've been trying out the Arm & Hammer Truly Radiant Toothpaste* and I feel like my coffee drinking ways really put it to the test. After the first time I used this, my initial thought was... "Wow, this stuff is INTENSELY MINTY." I swear, my mouth felt so fresh and minty that it actually felt like I'd used some pretty intense mouthwash rather than just a toothpaste. Now, perhaps this is because I had been using natural toothpaste for well over a year before this and I just forgot how normal toothpaste feels. In fact, I very much think that might be it. Now, when I say intensely minty, I really don't mean it in a bad way. My mouth felt really, really clean and I loved it. Anyone else apply toothpaste like a in a commercial and find that it's way too much? I do! And I've learned with this one that I really only need the pea sized amount that you're supposed to use and it absolutely does the trick. Why do I feel the need to point this out? I don't know... I feel like I brush my teeth like a fiend and end up with a toothpaste mustache, so I'm currently actively trying to use less toothpaste and I felt like now was a good time to mention it! Okay, now for the claim of a radiant smile in Just 5 Days! Yep! 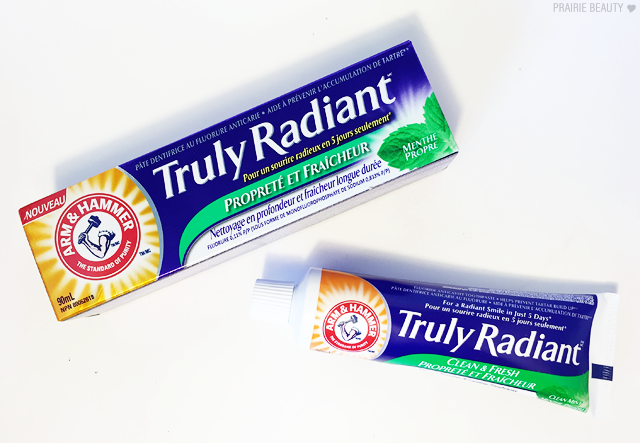 I've definitely seen a significant difference since I've been using this toothpaste in the brightness of my smile. In fact, I honestly see it immediately after I brush, but it has been cumulative as well. Now, this wasn't like a whitening treatment and I didn't seen a change to several shades lighter, but it is definitely dealing with all of that coffee I drink and taking away the dullness that it causes. But even more importantly, aside from the way it makes my teeth look - it really does make my mouth feel clean and fresh. This is definitely a toothpaste that I would recommend and will definitely be picking up in the future. 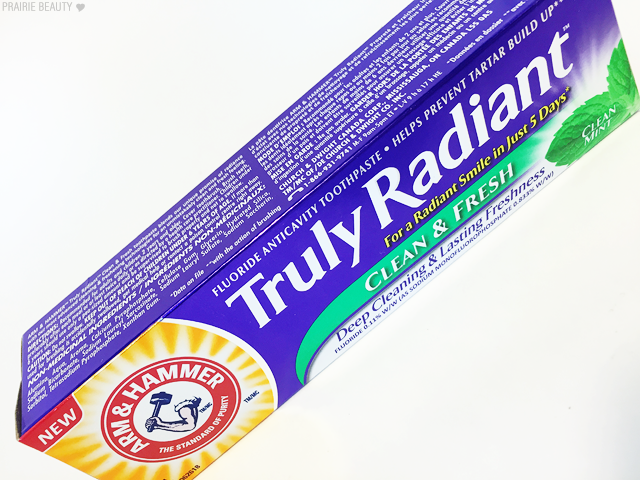 The Arm & Hammer Truly Radiant Toothpaste* is widely available... pretty much wherever toothpaste is sold, so definitely keep it in mind!